Recently, I was invited to a cheese workshop by the European Union and CNEIL, France. 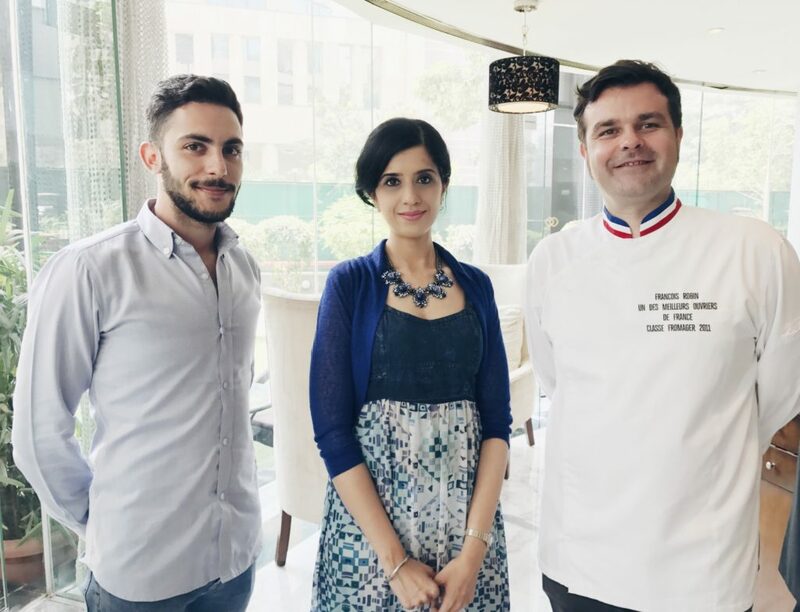 The very exuberant and kind French Chef Francois Robin who has been awarded "Best Cheese Monger in France" took us through a blind tasting of the cheese and then later demonstrated simple yet exquisite recipes using Indian herbs and spices. This also showed the fact that food brings people, communities and countries together. Chef Francois Robin very kindly made a Camembert pie stuffed with fruits without alcohol for me. And the Chèvre with coriander was magical too, apart from the baked Camembert with nuts which was my favourite. All the cheeses given to me were vegetarian without animal rennet in it. My best wishes to Chef Francois Robin, one of the most good humoured chefs I have met and thank you to the EU and CNEIL for inviting me to this event. To my left is the wonderful Julian Hoarau from the French Embassy in India.